I'm sure you have realised by now that I love to exercise, especially running but one thing I have always struggled with when it comes to working out when away from home is being able to carry any of my belongings with me. 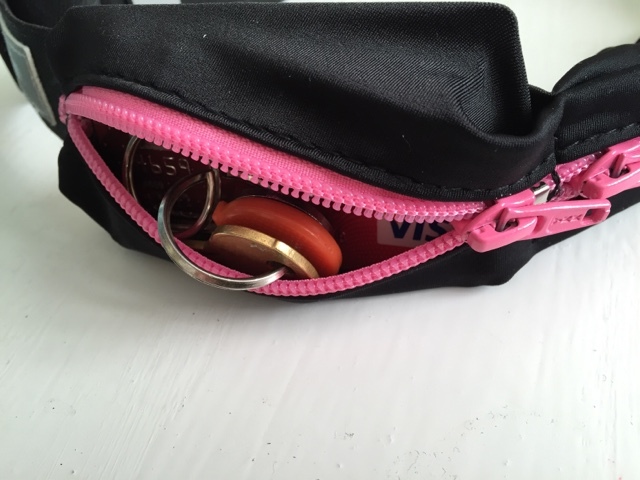 I feel a bit lost having to leave my phone and keys at home due to lack of pocket space and that is where The Fitbelt comes in to help. 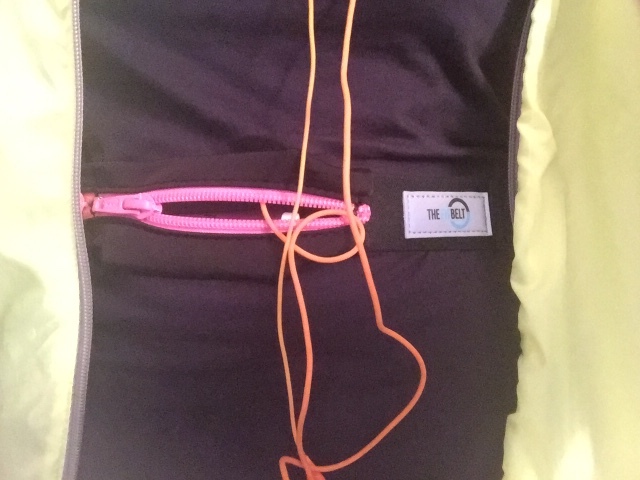 Available from Amazon, this is essentially a belt which has enough storage space to allow you to take keys, money and phone along with you on your run without affecting how you run. You can choose from either black, blue or pink zips, I opted for the girlier pink. It is adviced to wear it either around your hips or around your waist, I found it more comfortable on my waist as shown below. The belt itself is quite wide and made from soft, stretchy material making it super comfortable. It's also very adjustable so suitable for many to wear. Reflective bands also increase your visibility making it brilliant for running in these colder, darker months as drivers and other pedestrians will be able to spot you from further away but it can of course be worn under clothes if you don't fancy having it on show. Storage itself is ideal. I can fit my iPhone 6 in the larger pocket and I was able to carry my bank card and keys in the smaller one. Even with all of these things inside it didn't appear or feel bulky at all. I was surprised at just how much it could contain without adding too much weight. 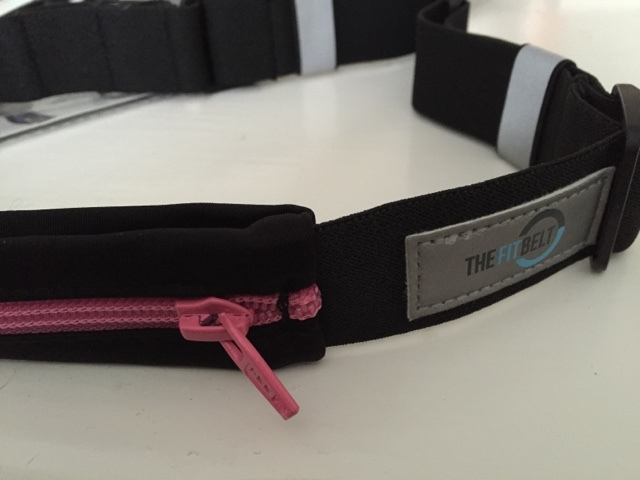 Coming with a free ebook and lockable laces I'd highly recommend The Fitbelt and of course it isn't just for runners, it can be used simply when going for a walk, maybe when going to a concert and you don't want to carry a bag on you, really there are plenty of possibilities. Now if you like the sound of The FItbelt you can enter my giveaway below to be in with a chance of winning one. Simple fill in the rafflecopter form, making sure to enter correctly as all entries will be checked and verified. This is open to UK residents only and will close on the 4th January 2015 at 11.59pm. I walk everywhere and I practise yoga. I like to do weights. I love to walk, especially when the scenery is good!! Power yoga & body pump! Lots of walking and using my cross trainer. I do exercises from YouTube. I like to run, but I haven't been doing it often in the past few years. I really need to get back into it. I walk a couple of basset hounds twice a day that takes hours. I love cycling and running. I go road biking and mountain biking and also participate in my local 5K Parkrun. Running and going to the gym! I like to do Yoga. I like to swim and walk! I try to go to the gym but it has happened a lot less frequently recently!! at the very least, through dog walking, but I do try to work out regularly. I hate most exercising but I do love walking and try to go on a 30 minute walk everyday. I enjoy walking, jogging and rowing. I love exercise DVDs & running - going to try p90x at some point when i'm brave enough. I walk as prescribed by my physiotherapist. I walk or jog at least a mile a day. I like dancing and walking. the truth is that I don't like keeping fit, I find it boring and hard to motivate myself. the only thing that stops me being a complete couch potato is that I volunteer at a local inner city farm charity, and work in the stables one day a week. lots of manure & soiled bedding to be put in wheelbarrows and taken to the muck heap, lots of yard sweeping, poo picking and tack cleaning, and a dozen muddy horses & ponies to be groomed means that each Friday I get a very vigorous workout and thoroughly enjoy it all. I do a lot of walking and I really enjoy swimming although I seldom have time. I love to hula hoop and do sit ups...id like to get into jogging this year though. I walk everywhere as I do not have a car. Carrying large bags of cat litter also helps! I really don't like to keep fit but I do cycle as it's the most enjoyable mode of fitness for me. I run a lot, although when it is wet and cold my motivation somewhat suffers! Running around after my 2 year old! i try to keep fit by keeping active - walking, using stairs instead of the lift, going for jogs, I just need to do more of it now to get rid of the Christmas bulge! Getting out and about with my children.